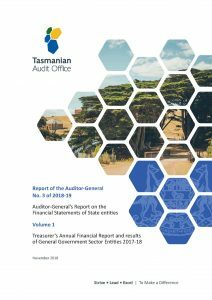 The focus of this Report is on the General Government Sector (GGS), which consisted of Government departments and not-for-profit State entities controlled and predominately financed by the Tasmanian Government. The primary function of these entities was to provide public services for the collective consumption of the community. This Report includes statutory authorities and other non-profit entities not consolidated into the GGS financial statements. The Treasurer’s Annual Financial Report (TAFR) included the audited GGS and Total State Sector (TSS) financial statements and the Public Account (PA) statements. It also included other information, such as an overview of the Fiscal Strategy and the Loan Council Outcome, which were not audited. This Report provides financial analysis of the GGS and TSS sector and of the PA statements. A separate Chapter has been included on the operations of the Superannuation Commission and the results of the audit of the Retirement Benefits Fund for the years ending 30 June 2017 and 30 June 2018. For 2017-18, each Chapter includes infographics that provide a snapshot of key data or statistical information applicable to the entity. In addition, results and assessments of the financial performance and position of other GGS entities, Executive and Legislature and other State entities have been summarised in a separate Chapter.